Download Maine rental agreements that, according to Title 14 Chapter 710, allow a landlord and tenant to come to terms over the use of residential or commercial space. The tenant is allowed to occupy the agreed upon space in return for a monthly payment to the landlord. In Maine when a document has been agreed to, signed, and acceptance has been given to each party the form becomes legally binding to both lessor and lessee. Rental Application – Form used to screen a tenant before signing a lease to ensure their employment, income, credit, background, and any references make sure the person is a valid lessee. Commercial Lease Agreement – Provided by the Maine Association of Realtors for any net lease for business-related property. Lease with Option to Purchase (Lease to Own) Agreement – Rental arrangement between a landlord and tenant which also allows for the purchasing of the property according to certain agreed upon terms and conditions. Month to Month Lease Agreement (Title 14 § 6002) – Known as a tenancy at will which has no end date but can be canceled at any time by either lessor or lessee and sending a notice at least thirty (30) days before the next payment date. Room Rental (Roommate) Agreement – By and between individuals sharing a housing arrangement. 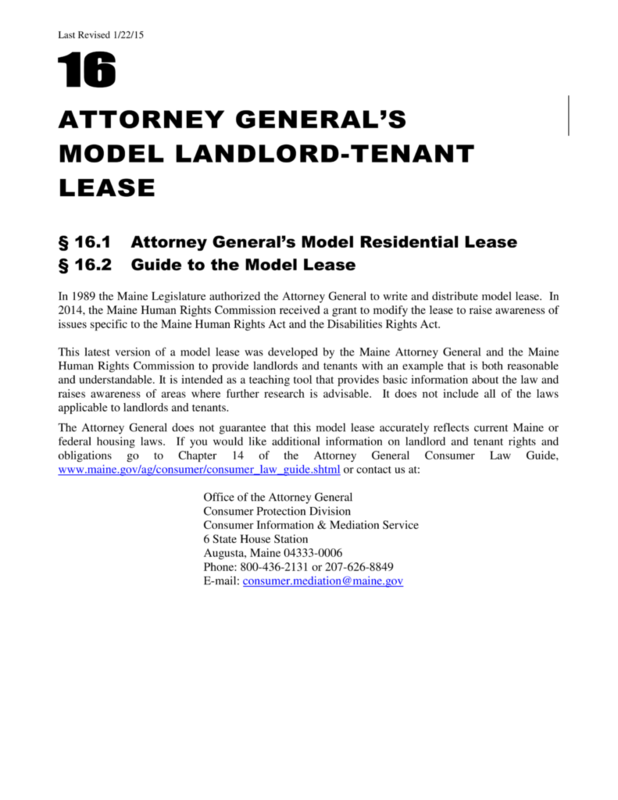 Standard Residential Lease Agreement – Provided by the Attorney General, the document is pursuant to all Maine laws for a standard fixed rental arrangement. Sublease Agreement – Arrangement between a tenant under a lease and a new tenant, the “subtenant”, who rents directly from the original and must follow the rules and regulations of the property. Termination Lease Letter (Title 14 § 6002) – To give notice to the other party for terminating a tenancy at will (month-to-month). Bedbugs (§ 6021-A) – If the rental unit or adjacent rental unit is being treated or currently has bedbugs it must be relayed to the tenant in writing. Read also the Fact Sheet published by Maine Housing. Electricity to Common Areas (§ 6024) – Unless both parties agree, the landlord may not bill the tenant for electricity, heat, or any utility or service that is for common areas in the property such as hallways, stairwells, etc. Energy Efficiency Disclosure (§ 6030-C) – Required to be completed by the landlord and signed by the tenant. Lead-Based Paint – Due to federal law, all residences built before the year 1978 must have this form attached and signed/acknowledged by the tenants. The document informs them about the potential of hazardous paint within the walls and to always be on watch for cracking or chipping paint. Radon Disclosure Form (§ 6030-D) – Starting in 2012, the landlord is required every ten (10) years to check for the existence of this type of gas. This form must be issued to every tenant. Security Deposit Location (§ 6038) – The landlord must give the bank name and account number where the funds are being stored. Smoking Policy (§ 6030-E) – Landlord must state what the smoking policy is on the property, whether it is allowed, only in certain areas, or outright prohibited. According to § 6025 the landlord must give at least twenty-four (24) hours notice before entering the tenant’s property for any non-emergency situation. Maximum (§ 6032) – A limit of two (2) months’ rent may be asked for at the time of commencement. Returning (§ 6033) – The landlord must return the funds within thirty (30) days if it is a fixed lease and twenty-one (21) days if it is a month to month rental (tenancy at will).